• SCREEN PROTECTOR INCLUDED: Tempered Glass Ballistic made of Nano-chemical substances, is built with 0.33 mm thick, laser cut tempered glass and has been rounded and polished to provide 2.5D edges. •TEMPERED GLASS: Offers a 9H+ scratch resistance, which ensures that it is shockproof, pressure resistant, and protects against scratches of all sorts. • PREMIUM QUALITY MATERIAL: Made from Metal brushed aluminum(INO Alloy), ultra slim and light weight. Gives your phone a premium look. • SNUG FIT: engineered to emphasize thinness without compromising Phone security. Precise cutouts give you full access to ports, and sensitive button covers allow responsive presses. • IMPACT-RESISTANT DUAL-LAYERS: constructed from hard polycarbonate and solid aluminum. The inner layer cushions the Samsung Galaxy S6 Edge from drops, while the outer layer encases the Device to shield from more serious collisions. Covers all four corners and Lay-flat Screen Guard to provide the ultimate screen protection. 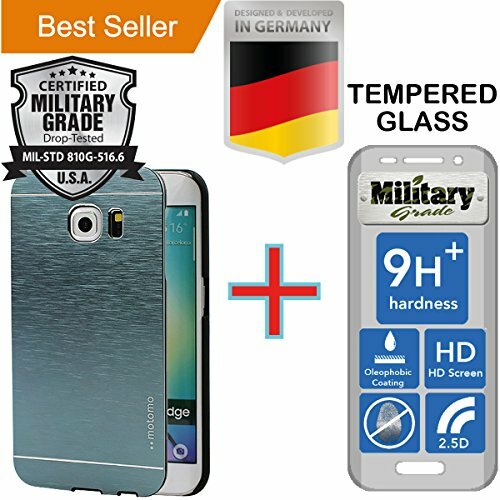 • EASY TO INSTALL: Made for Samsung S6 Edge 5.5 inch, 100% perfect fits for your Phone. Easy to install and remove. SCREEN PROTECTOR INCLUDED: Premium Laser Cut Tempered glass, 9H+ Balistic Hardness with an Oleophobic coating, anti-bacterial, anti-fingerprint, anti-oil, water resistant and ultra clear shock-resistant layer. It screens oils, smudges and fingerprints, offering an High Definition clarity and precise touchscreen experience. PREMIUM QUALITY: Made from Metal brushed aluminum, ultra slim and light weight. Gives your phone a premium look. IMPACT-RESISTANT DUAL-LAYERS: constructed from hard polycarbonate and solid aluminum. The inner layer cushions the Samsung Galaxy S6 Edge from drops, while the outer layer encases the Device to shield from more serious collisions. FULL DEGREE OF PROTECTION: covers all four corners and Lay-flat Screen Guard to provide the ultimate screen protection. EASY TO INSTALL: Made for Samsung Galaxy S6 Edge 5.5 inch, 100% perfect fits for your Phone. Easy to install and remove. If you have any questions about this product by MyNovation, contact us by completing and submitting the form below. If you are looking for a specif part number, please include it with your message.